Learn about important new developments and view the latest upcoming events for your area! This time of year always makes me feel grateful, and not just because of the Thanksgiving Holiday. I love the change of seasons, big meals with family and friends, dressing up in crazy costumes with my kids, and watching football while doing laundry each weekend (thankful for football, not laundry). We had such a great time at the Release Party, I am thankful that you have made our guide possible and allowed us to be a resource to you and our community. I hope you can find more of what makes you grateful this season. Exempt Employee Status for those making less than $47,476 will change December 1, 2017 and many companies are scrambling to decide how to make decisions about how this will effect employees. This presentation is specifically geared for Retirement Connection sponsors that are small business owners, managers impacted by this ruling, leadership responsible for staffing, and HR directors. 9 AM NEW Mid-Willamette Valley Sponsor Breakfast! 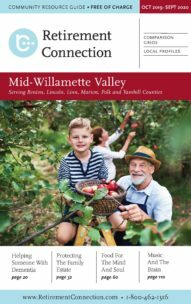 Retirement Connection Sponsors, join us for our first Mid-Willamette Valley Sponsor Breakfast, meet our staff, and learn about your sponsor benefits! 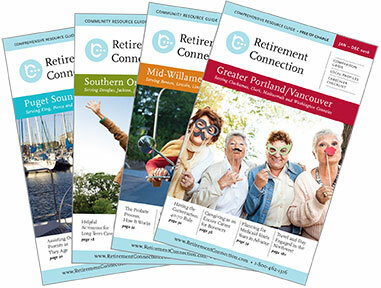 Registration is now open for Retirement Connection Sponsors. Don’t wait until the 4th Thursday in November to be Thankful. The more gratitude you express, the more you will see. I am thankful for the support and love of my family, the energy from the team I work with, the humor and insight of my friends, and even the criticisms from others that make me stronger. And none of these cost money! These are the things that make me rich. The following positions have been posted in the last month.